Insured by Mafia, powered by Big Data. Years ago when Big Data was just a vague bleep on the Gartner hype cycle, I was presenting a seminar to a group of Insurance executives. The speech was about ‘The Future of Insurance’ and I asked the audience what in their opinion was the best Insurance product. A lot of the responses were in the area of maximizing profit, maximizing coverage at a good price or a product that was easy to acquire. In my opinion, the best insurance product is the product that avoids the insured event from materializing. (Hence Insured by Mafia- on seeing that sign one is probably going to be more cautious) This way the client is happy (no damage, no hassle) and the insurer is happy, as preventing is almost always cheaper than restoring or compensating. Examples in that time were texting about an approaching hail storm or helping home owners prevent burglary by offering better locks. Nowadays the options are way more developed as Big Data, and subsequently Consumer Analytics, gives an abundance of possibilities to get more insight into the client and its coverage, in a way that enables client centric approaches. Customer satisfaction is at its lowest, as seen from a recent study by Capgemini (https://www.capgemini-consulting.com/fixing-the-insurance-industry), which also proves that in general, Insurers have a huge challenge in the area of Customer Satisfaction. The study finds that less than a third of the customers are satisfied with the service they get from their Insurers. There was a time when the Insurer interacted almost solely with the client in “the moment of truth”- that moment being the claim after an accidental event or the life insurance to be paid out. In this modern era, that is not what the customer expects. They expect to be nurtured with targeted offers and services and for instance, do not want to pay an average premium based on the (randomly) collective they belong to but a fair premium based on their individual situation. Pay as you drive (and how you drive) is by now a widely accepted model that is alluring for the client and is made possible by constant interaction between the Insurer and the Insured. Big Data and Consumer Analytics bring the possibilities for Insurers to adopt a client-based instead of product-silo based approach. Modern techniques like Data lakes are becoming mainstream and at a mature level allowing the Insurer to combine not only their own data sources but enrich that with external data sources as well. Structured and unstructured data are now easily manipulated in to a powerful platform that forms the basis for analytical techniques uncovering hidden patterns, predictive trends and granular data (360° view) on the client. So why not use these possibilities to enhance client satisfaction? Why not take this warning by the client seriously? Some early movers in the field of insurance are already out there threatening the established parties in the market. A new entrant in the Japanese Life Insurance market has built a strong portfolio in just 4 years with a YoY growth of over 34%, in 2014. The key to this success was leveraging insights derived by analytics to build a strong customer experience. Other new entrants are leveraging the power of insights to combine buyer groups and negotiate better rates. And the example that is my personal favorite; FM Global has launched a service called “RiskMark” (http://www.fmglobal.com/riskmark_assets/riskmark_overview.htm) to help its clients better understand the risk exposure of their properties. Closer to home, I recently had a conversation with an old friend from college who is employed by a renowned Insurer in the Netherlands telling me that they were building models to predict burglary. Imagine the possibilities to enhance predictive policing (using predictive models to station a police officer on the spot where an event is most likely to occur) on the actual home-front where you will be able to prevent the damage that might occur. And imagine the possibilities in Healthcare where individual insights could not only promote a healthier life but also take care of living a healthier life. Wouldn’t Insurers offering these types of services not only make a giant leap in Customer satisfaction but also optimize their cost/income ratio? 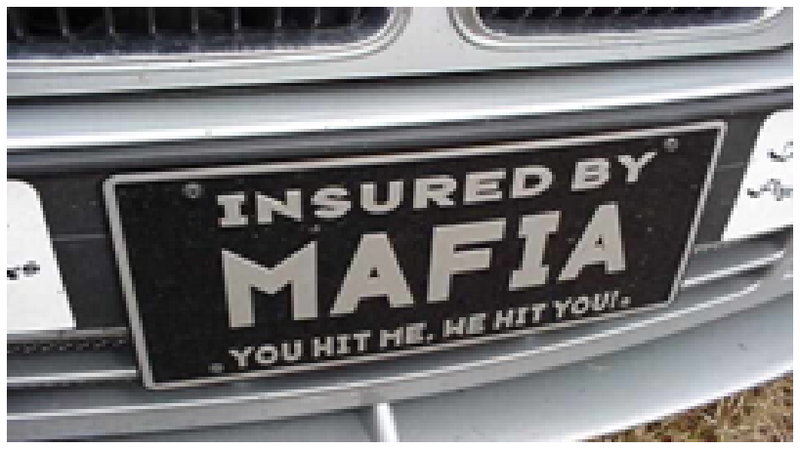 Who knows, we might not even need the “Insured by Mafia” sign but could replace this by the “Covered by preventive Insurance” sign.